Guest Column: Disturbing Questions Lurk Behind Dutch "Jihad Galas"
It's hard enough choosing the right gown for the Oscars, the prettiest frock for Junior Prom. But how do you select the burqa that best befits a jihadi gala? Two such soirees, ostensibly being staged to raise money for humanitarian aid to Syria, Palestine, and elsewhere in the Middle East and Asia, have raised controversy in the Netherlands in recent weeks. Nicknamed "jihad galas" by local media, both events have been forced to revamp their programs and venues after the government raised concerns about several of their invited speakers. In the process, heightened focus on the two organizations has helped unveil a web of secrecy and deceit behind many such endeavors and the people who support them. The first event, tentatively scheduled to take place in Utrecht on March 1, aims to raise funds for World Wide Relief (WWR), a Dutch-based organization that supports children in Syria, among others. 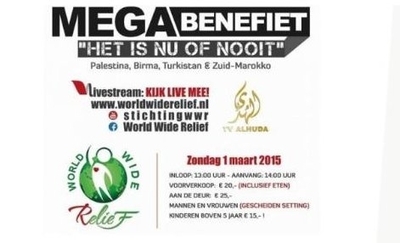 The other, originally set for March 8 in Rijswijk and now planned as a live-stream event to be broadcast from an undisclosed location, will benefit Holland's Rohamaa Foundation, a self-described "Islamic-inspired" charity that aids communities in Morocco, Tunisia, Egypt and Southern Turkey. But according to a number of reports, the two groups, which claim to have each raised hundreds of thousands of euros from Dutch Muslims, have links to Salafist preachers and supporters of ISIS and al-Qaida. Several of those preachers were invited to speak at the galas, including some from the Middle East who received visas from the Dutch government to do so. Immediately, concerned Parliament members, armed with information provided by the National Coordinator for Counter-terrorism (NCTV), protested, successfully demanding that the visas be rescinded in light of the imams' anti-Western, Salafist profiles. The uproar has led to changes in plans for both galas, though Rohamaa has hinted that its invited speakers will still be heard via the live-stream broadcast. While the government has not banned either event from taking place (Rohamaa itself made the decision to hold the event online), the controversy surrounding the two galas has set off heated debates about the meaning of "free expression" in the current climate: If you allow Charlie Hebdo's provocative content, shouldn't you also allow the anti-Western tirades of Salafist imams? If not, why not? The question touches on a highly sensitive issue that has long raised hackles even among members of the United Nations: Resolution 16/18, an initiative of the Organization of Islamic Cooperation, which bans speech that would be construed as "incitement to imminent violence," received U.S. approval in 2011. The problem with this argument, and with Resolution 16/18, is that the Mohammed cartoons do not, in themselves, incite violence, however much some Muslims might insist otherwise. They are simply used that way by religious fanatics and Islamists whose twisted logic determines that anger and insult are reason enough to justify violent behavior. Rohamaa invitee Muhammad Hussan has referred to Jews as "those hateful and disgusting creatures." He also owns Al-Rhama TV, whose programming, according to MEMRI, frequently exhorts Muslims to annihilate the Jews. If you're looking for speech that "incites violence," it would be hard to find better examples than these. WWR in particular seems to have forged a strong and intricate network among the stars of Salafist activity. In addition to partnering with al-Hakeem and Baali, WWR founder Abou Hafs has also chummed up with the Belgian extremist Tarik Chadlioui, aka Tarik ibn Ali, considered one of the top fundraisers for Salafist causes in Europe. Just last year, Ronald Sandee, a former Dutch secret service official, described Chadlioui as "one of the most important influences behind the now-banned organizations Sharia4Belgium and the German Millatu Ibrahim, as well as the Dutch Sharia4Holland. He has many contacts via social media with young men from Belgium, Holland, and Germany who have joined the jihad in Syria." World Wide Relief is also frequently praised on Dutch jihadists' web sites, according to Dutch newspaper NRC Handelsblad. Even Hafs, the NRC reports, has been known to praise Dutch Muslims who travel to Syria to join the jihad. The father of 19-year-old Dutch suicide bomber Sultan Berzel, who blew himself up in Baghdad, killing 20 others, has accused him of spreading "IS ideology." In speeches across the country, Hafs calls on fellow Muslims to resist the influence of "kuffars" (unbelievers) and to separate themselves from Dutch society or secularism by refusing to vote in Dutch elections. But if that's not enough to keep you from ordering up your Albert Nipon niqab, your abaya by Alaia and sending in your contributions to the cause, try this: no one really seems to know exactly what Rohamaa and World Wide Relief fund actually do with their donations. Though Rohamaa claims to work through Allah "in an Islamic way," it seems to do so secretively: its website provides no information about its officers or administrators, let alone its financial activities. (A button for "sponsors" on its home page is inactive.) And no reports seem to be available on its finances, beyond the basic banking information one would need to wire a donation. The same seems to be true of World Wide Relief. An extensive investigation by the NRC Handelsblad revealed that the organization consistently failed to submit annual reports of its activities as required by law. There may be a reason for this: based on what information is available on the charity's website, Roland Sandee, now the chief global jihad analyst for the Kronos Advisory think tank, calculated that only half of the €150,000 allegedly devoted to humanitarian aid in Syria had actually been spent – though details about the use of those funds are lacking. What happened to the other €75,000 is a mystery. This, while dozens of European Muslims head off to Syria in the guise of "humanitarian aid." In fact, says the NRC, many fundraisers for such organizations themselves eventually "show up in Syria as jihadists." Officials who spoke to the NRC also noted that, "A portion of the collected funds [of these charities] is likely given to non-humanitarian causes." At the Oscars, at least, no matter what you wear, you know who the winners are. What's clear about these galas is we're the ones who lose. Muslims have to realize that they have to clean up Islam, no one else can do it for them. Just like Christianity was cleaned up by Christians, and the same is true for Hinduism. Moreover, it will be just as long, painful and everlasting battle as it is for other religions. The only difference is that in the dark ages popes and shankaracharyas did not have modern weapons or internet. Today, fundamentalists can do far more harm, so the world is running out of time.